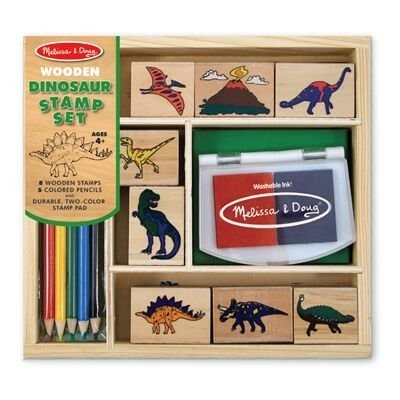 With the Melissa and Doug Dinosaur Wooden Stamp Set, your child will have a blast decorating with their favorite dinosaurs! Each set includes 8 wooden stamps and 1 two-tone, washable, non-toxic stamp pad. 5 colored pencils are also included, so your child can bring their stamped scenes to life! The Dinosaur Stamp Set is packaged in a sturdy wooden box for organization and storage. For more fun toys and kits for Mighty Girls who love to draw, paint, color, and more, visit our Arts and Crafts Collection.